2010, "U.S. Military Bases and Their Impacts in Okinawa,　Japan"
-I was the Consul General in Okinawa until 2009. It is　said that a half of U.S. bases in Japan is located in　Okinawa, but the statistic only includes bases used　exclusively by the US Military. If all bases, US bases　and bases jointly used by the US and JSDF, are　considered, the percent of bases in Okinawa is much　lower. -The controversial bases in Okinawa were originally in　the middle of rice fields, but are now in the middle of　towns because Okinawans allowed urbanization and population growth to surround United States facilities. -The US bases in Okinawa exist for regional security. The Japanese obligation under the US-Japan security treaty is to provide land for bases. The relationship between Japan and the US under the security treaty is asymmetric and benefits the Japanese to the detriment of the US. Japan is not obligated to defend the United States if US forces are attacked, but the United States must defend and protect Japan’s people and property. -Collective security is not a constitutional issue, but a policy issue. -Eighteen thousand (18,000) US Marines and an air wing are stationed in Okinawa. The United States needs bases in Okinawa for two reasons: bases are already there and Okinawa is an important geographical location. - (While showing a map of East Asia) US Forces Japan is headquartered in Tokyo and is the location of a logistics hub that would coordinate supplies and troops in the event of a crisis. Misawa, an important base in the Cold War, is the closest U.S. base to Russia and the base at Iwakuni is only 30 min from Korea, yet Okinawa’s geographic location is important to regional security. -Okinawa was an independent Kingdom paying tribute to China, although it has never been a part of China. The U.S. occupied Okinawa until 1972. -The Okinawan people’s anger and frustration is directed at Japan rather than the United States.The DPJ government does not understand Okinawa. The Japanese government does not have a “pipe” of communication to Okinawa. When I offer to contact people in Okinawa DPJ officials say “Yes! Yes, please!” The LDP communicated with Okinawa and understood Okinawan concerns better than the current DPJ government. -One third of people believe the world would be more peaceful without a military. It is impossible to talk with such people. -The 2009 electionbrought the DPJ to power, which was the first change in the government of Japan.Hatoyama was a leftist politician. Despite the DPJ and PM Hatoyama, the US and Japan managed to issue the 2+2 statement in May. -There is nowhere else to base US Marines. The DPJ suggested a replacement facility in mainland Japan, but there is no place in mainland Japan for the US Military. -Japanese culture is a culture of "Wa" (harmony) that is based on consensus. Consensus building is important in Japanese culture. While the Japanese would call this “consensus,” they mean “extortion” and use this culture of consensus as a means of “extortion.” By pretending to seek consensus, people try to get as much money as possible. Okinawans are masters of “manipulation” and “extortion” of Tokyo. -Okinawa's main industry is tourism. While there is an agricultural industry, the main industry is tourism. Although Okinawans grow goya, other prefectures grow morethan Okinawa. Okinawans are too lazy to grow goya. -Okinawa has the highest divorce rate, birthrate (especially out of wedlock) and drunk-driving rate due to Okinawa’s culture of drinking liquor with high alcohol content. -You should be carefulabout “tatemae and honne” while in Japan. Tatemae and honne is the “idea that words and actual intentions are different." 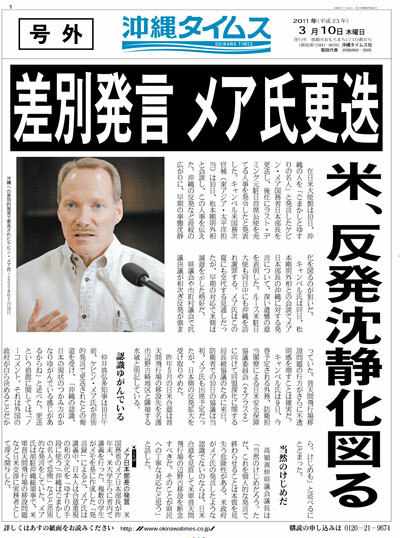 While in Okinawa, I said MCAS Futenma “is not especially dangerous." My statements caused Okinawans to protest in front of my office. Although Okianwans claim MCAS Futenma is the most dangerous base in the world,they know it is not true. Fukuoka Airport and Osaka Itami Airport are just as dangerous. -Japanese politicians do Tatemae and Honne all the time. Okinawan politicians will agree to a negotiation in Tokyo but return to Okinawa and claim they did not. The US Ambassador and other representatives to Japan are constantly criticized for speaking the truth because the Japanese culture is too focused on tatemae and honne. -The US Military and JSDF have different mentalities. The US Military trains to prepare for possible deployment, but the JSDF train without actually preparing for deployment. -Local people oppose to night training by the US Military but it is necessary because modern warfare is often fought at night. Night training is essential to maintain deterrence capability. -I don’t think Article Nine of the Japanese Constitution should change. I doubt it will ever be changed. It would be bad for the United States if the Japanese Constitution was changed because Japan would not need the United States’ Military. If the Japanese Constitution was changed the United States would not be able to use Japanese land to advance US interests. The high host nation support the Japanese government currently paysis beneficial to the US. We’ve got a very good deal in Japan.